Big Ten predictions: Can Wisconsin finally win at Michigan State? Posted on Thu, Oct 20, 2011 : 7:22 p.m. The Michigan State football team celebrates its 35-24 win over Wisconsin on Oct. 2, 2010. Wisconsin football coach Bret Bielema won't call a road loss to Michigan State in 2008 the low point of his coaching career. But it was a very valuable one. "It proved to me at that point how difficult it is to win on the road." Bielema said. "You have to play disciplined football and you have to recruit the type of athlete that can play disciplined football, and I don't think you can teach that." Sitting at 4-4 entering that game, the Badgers blew an 11-point second-half lead in East Lansing before falling 25-24. It was the low point in a disappointing 7-6 season for Wisconsin. A year ago, the Badgers' 34-24 loss at Spartan Stadium was the team's only regular season blemish on the way to a Rose Bowl appearance. Bielema and No. 4 Wisconsin will venture back into East Lansing on Saturday (8 p.m., ESPN) for a nighttime date with the No. 15 Spartans (Preview). He says his team has learned from its past mistakes, and Bielema and company will get a chance to prove it in front of a national, prime time audience. "It's a very difficult environment to win in," he said. "Especially when Michigan State's rocking and rolling." The winner of this one likely grabs the wheel for the Big Ten regular-season title race. The Badgers are perfect on the year, and have steamrolled everyone in their path -- outscoring opponents by more than 40 points per game. However, Wisconsin hasn't played a true road game yet. Michigan State? Well, the Spartans are one week off a physically dominating performance over rival Michigan. In Spartan Stadium, of course. "When you play at home you have a lot of things going for you," Michigan State coach Mark Dantonio said. "We don't play many night games here so that's always a live atmosphere, and those two things will weigh in our favor." The contest features two of the country's top defensive units. Michigan State is ranked No. 2 nationally in total defense, giving up just 186.17 yards per game. Wisconsin isn't far behind, ranked No. 7 with 268 yards allowed per contest. The Badgers have the makings of a national title contender, and quarterback Russell Wilson is a Heisman Trophy candidate. But before anyone starts getting into those topics, Wisconsin will have to survive one of its biggest road obstacles in recent years. ""When you have your family here and the people you care about watching the game," Dantonio says, "you tend to play a little bit harder." The AnnArbor.com sports department is picking the winners of Big Ten football games this season, with bragging rights in our corner of the newsroom at stake. Check out last week’s results below, after you play along with us by choosing your own winners. Nick Baumgardner: If Purdue was any good, it would be able to take advantage of a shaken Illini squad. But, Purdue’s not good. Illinois. Pete Cunningham: What’s the etiquette on the visiting team firing The Cannon? Illinois. Jim Knight: Purdue had a five-game winning streak in this matchup end last season. Now it’ll be a two-year skid. Illinois. Kyle Meinke: What's the perfect remedy for a loss? Well, a date with Purdue of course! Michigan, take note. Illinois. Rich Rezler: Will Michigan fans spend their Saturday “scouting” the Boilermakers or head over to the pumpkin patch to pick out their Illini helmet-inspired Halloween decorations? Illinois. Baumgardner: Indiana couldn’t beat North Texas on the road. How’s it supposed to win in Kinnick? Iowa. Cunningham: SportsCenter should be required to play “Yackety Sax” during Indiana game clips. Notice, I did not say highlights. Iowa. Knight: This isn’t as automatic a pick as you might think. Iowa won by just five points last season. They’ll win by more this year. Iowa. Meinke: The Hawkeyes may not be great, but they're also not Indiana. At least, that's what Kirk Ferentz tells himself to fall asleep. Iowa. Baumgardner: Minnesota didn’t lose last week. It was off. That changes Saturday. Nebraska. Cunningham: See Indiana prediction. Same goes for Minnesota. Nebraska. Knight: Sorry, Minnesota. You’ll want to forget this season. Nebraska. Meinke: The Cornhuskers have won 14 in a row in this rivalry, outscoring the Gophers 553-100 in that span. Considering Minnesota might be the worst BCS team in the country, can't see this one going much different. Nebraska. Rezler: This is the 3:30 p.m. ABC game? Seriously? Somewhere, Keith Jackson is rolling his eyes. Nebraska. Baumgardner: Oh, the Battle for the Old Ball of Yarn. I’ll pick Northwestern for the upset. Hopefully the Wildcats don’t make me regret it. Northwestern. Cunningham: Penn Sate just might be one of those teams we think isn’t that good, but finds a way to win a lot of close ones. Northwestern might be a team we think is decent, but always finds a way to lose those same games. Penn State. Knight: This time, Northwestern hangs on to its first-half lead. Northwestern. Meinke: I'll repeat what I said last week: The Wildcats were unbeaten last year with Dan Persa at quarterback (7-0), winless this year (0-3) and he's too good for that trend to continue. I figure as long as I keep saying this, at some point, I'll be right. I think. Northwestern. Rezler: I actually like Northwestern here, but some outside force (the legend of JoePa, perhaps?) is telling me to type: Penn State. 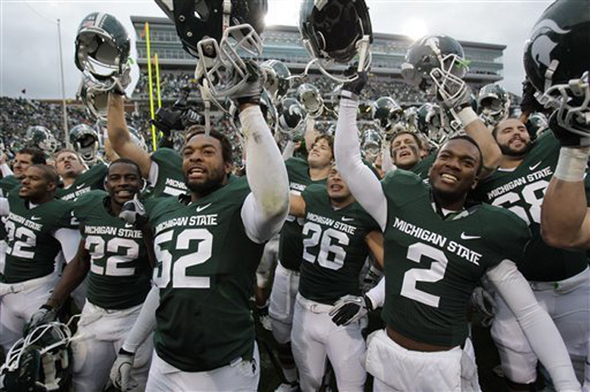 Baumgardner: Michigan State flexed its muscles last week against Michigan. Good luck doing the same against a legit Top 10 team. Wisconsin. Cunningham: Michigan State is a good Big Ten team, Wisconsin is one of the best teams in the country, period. Kurt Cousins has not shown an ability to give the Spartans the two or three big plays a senior quarterback needs to make to win this type of games. Wisconsin. Knight: Wisconsin should take charge late. Wisconsin. Meinke: The Spartans are coming off that bruising rivalry game against Michigan, and will be without defensive end William Gholston. Oh, and Wisconsin's better. Wisconsin. Rezler: Picking an upset here for three reasons: 1) This is Wisconsin’s first real road test of the season. 2) Michigan State is sky-high after last week (buckle those chin straps tight, Badgers) and Spartan Stadium will be hopping. 3) The Badgers are 55-16 under Bret Bielema, but just 11-11 in Big Ten road games and 0-2 in East Lansing. Michigan State. Last week: Rezler 4-0, Knight 3-1, Baumgardner 2-2, Cunningham 2-2, Meinke 2-2, Reader polls 2-2. Season: Knight 11-2, Reader polls 10-2-1, Baumgardner 10-3, Rezler 10-3, Cunningham 9-4, Meinke 9-4. Sun, Oct 23, 2011 : 4:03 a.m. It's 11:40 PM Saturday - Wisconsin just lost to MSU in the last 3 seconds of regular time. So it appears Wisconsin (No. 4 nationally until a few minutes ago) DOES have some kind of curse on them when it comes to games against the Spartans. The Badgers had just tied the game and, on the last-minute Spartan drive, the ball ricocheted OUT of the end zone but was caught by another Spartan about 2 feet from the goal line. Wisconsin players tried to stop the ball carrier and seemed to succeed. But instant replay showed the Spartan's twisting backward motion actually brought the ball (fractionally) over the plane of the goal line. This was as close to a &quot;phantom touchdown&quot; as ever was seen. It was just as amazing to see MSU win as it was to see Michigan's win against Notre Dame. OTH: this makes Michigan's loss to the (perennially average) Spartans less embarrassing. If the No. 4 team couldn't beat them, then (former) No. 11 Michigan never had a chance either. This season: the Spartans have the gods of football on their side. (But they won't next year, we can be sure of that.) I certainly hope that Hoke and his Wolverines watched this game. The Badgers dominated early but slumped through the 2nd and 3rd quarters. Poor play by the offensive line (please note!) was one factor in the Badgers' demise. Letting the Spartans pile up points (after holding them to 0 pts in the 1st quarter) showed the Badger defense had a let down too. Tying the score with 1:06 left wasn't enough - the miracle last series by Sparty played out like a nightmare for Wisconsin. If the game had gone into overtime, the Badgers had the better odds of a win but that was not to be. Lesson: second rate coaches and teams like Dantonio and his gang are here to make legitimate coaches and teams look bad. It's as simple as that. Sun, Oct 23, 2011 : 3:51 a.m.
Looks like 69% of people were dead wrong. Go Green! Sun, Oct 23, 2011 : 2:42 a.m.
10 minutes left in the 4th and MSU up on Wisconsin 31 to 16. A lot can happen in 10 minutes, but the &quot;feel&quot; of this game says Michigan State. Given my confident prediction of Wisconsin wiping up with MSU, let me be the first to say I was wrong. I honestly did not think MSU could run with Wisconsin, but they did ... and that's despite being down 14 early. So good for you, MSU ... you went to the big stage and played well. So good for you. Fri, Oct 21, 2011 : 3:51 p.m. I'm SO glad the thug is out for the game. He should have been suspended two games. One for the sucker punch and one for trying to paralyze Denard with the neck twist. WISCONSIN WINS!!! Fri, Oct 21, 2011 : 1:05 p.m.
Wisconsin's impressive stats have come against five of the worst teams in the country and their win over Nebraska was fueled by three straight interceptions against a sophomore QB. So it remains to be seen just how good they really are. Wilson has been spectacular, but he's also benefited from inferior opponents packing the box against the run. His performance also tends to fall off in road games. Wisconsin's run defense has been merely average, again against weak teams, while MSU's O-line has made huge strides since the ND debacle. So State's going to be able to move the ball on the ground. With State's D, I don't see Bucky hanging more than 21 points on them, 28 max. If Cousins has a decent day, I think they win. Fri, Oct 21, 2011 : 11:43 a.m.
MSU loses because of suspension of key player. Karma has a way. ...of assuring a State victory. Fri, Oct 21, 2011 : 11:35 a.m. The games featuring our future opponents; Purdue, IA, IL and NE. The IL @ Purdue match up will be interesting and could be close. I will want to tune in and watch this one closely. Maize and Blue fans will be rooting for the Red and White of Wisc to spank Sparty. No doubt, this is the most exciting time of the season. Fri, Oct 21, 2011 : 11:01 a.m. Yes.... WISKY WINS!!! The SKIRTS will have all eyes on them the rest of the year, due to the way they play. Dream a little dream, lil bro. Fri, Oct 21, 2011 : 4:14 a.m. Yes. And it's not going to be close. Wisconsin is going to give a clinic on smack-down. I've said it before -- two motivations: (1) revenge for last year, and (2) they need the points to goose the BCS standings. Sun, Oct 23, 2011 : 4:07 p.m.
@Goofus -- you're absolutely right, and I was completely wrong. See below ... I admitted as much with 10 minutes to go in the game. At that time, win or lose, Michigan State's play had proved me wrong. I admit it. It was a close and hard-fought game. And Michigan State played tough but not necessarily dirty. So congratulations to Michigan State. A well deserved win. Sun, Oct 23, 2011 : 3:52 a.m.
wrong. And it was close too. Fri, Oct 21, 2011 : 3:28 a.m.
Fri, Oct 21, 2011 : 2:43 a.m.
Are kidding me? Can Wisconsin beat MSU in East Lansing? This year? The year in which Russel Wilson is the QB for the Badgers? The Wisconsin team that has 5 John Deer tractors up front on their OLine? Yeah...I'd say the Badgers stand a chance in this game. Fri, Oct 21, 2011 : 1:50 a.m. It's kinda surprising that only 55% pick Wisconsin over MSU. The MSU credo has always been: find a way to lose when you're on your way to better things. I think Michigan gets voodoo points for giving the Spartans such an ingrained sense of inferiority. Of course it's easy to do that when there's so much proof of it within easy reach (or Google search). As the commentary here says: the Badgers are coming and they aren't happy with the memories of those embarrassing loses to what is a mid-level team. No. 1 defense? We shall see. MSU roughed up Michigan, I have a strong feeling that MSU is about to experience the other side of roughness. Sun, Oct 23, 2011 : 4:04 a.m. I guess Wisky was a pretty poor surrogate for your frustrated ambitions.